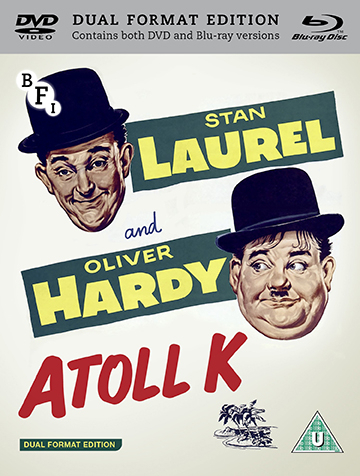 The feature-film finale of cinema’s most-beloved comedy duo, Atoll K marked Laurel and Hardy’s long-delayed big-screen return. The two great clowns, lured back to film amid the extensive stage tours of Europe that were the poignant coda to their career, embark here on a ramshackle voyage to save Stan’s Pacific-island inheritance. This ambitious attempt to invest their time-honed slapstick with a satirical edge is a testament to the duo’s indefatigable comic antics. The BFI is proud to release the longest-ever English-language cut of this historically important film, presented for the first time in High Definition and showcasing a new 2K restoration by the BFI using original 35mm nitrate film elements. Packed with special features, this release includes rare early solo shorts and amateur footage of Stan and Ollie, alongside new audio commentaries and contextual writing by internationally acclaimed experts on the life and work of ‘The Boys’.